Spend your first day getting to know your new travel companions as you explore the incredible temples of Kathmandu. Fly to Lukla, witnessing panoramic mountain views by aircraft, and meet the Sherpas and Yaks that will assist you on the upcoming trek. Trek alongside the Dudh Koshi River and through picturesque Tibetan villages. Continue walking along the bank of Dudh Koshi River, crossing many suspension bridges, and trek uphill to reach Namche. Visit a monastery of traditional Tibetan Buddhists in Tengboche, high in the foothills of the Himalayas. Desend to Debuche through the forest of birches and rhododendrons and witness views of Island Peak, Makalu, and Amadablam. Acclimatize and enjoy a short hike to see beautiful views of Lhotse and many soaring peaks. 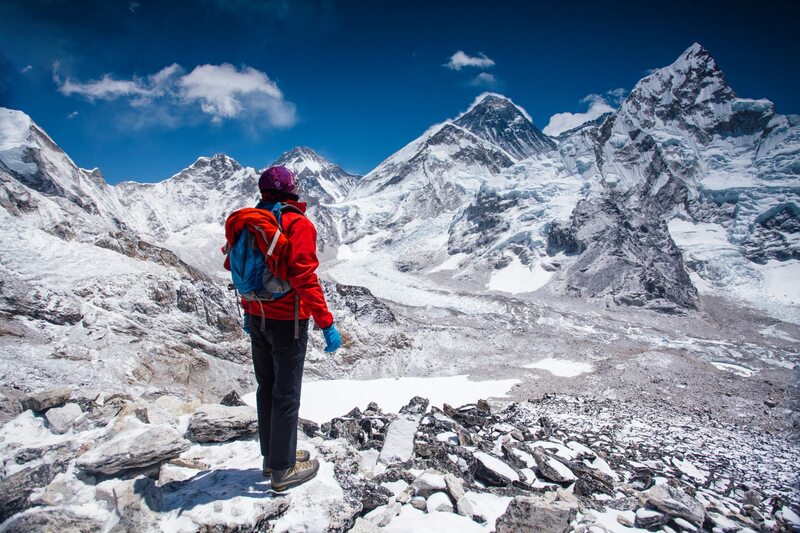 Trek across the frozen glacial river Thukla and make your way up to Everest Base Camp! Climb up to the Kala Patthar to view the summit of Mount Everest. This is one of the best places to photograph the panoramic view of Mount Everest and the entire mountain range. Descend over a few days past Tengboche, Monjo, and arrive at Lukla. Enjoy an evening celebrating with Sherpa friends! and explore the vibrant local markets of Thamel. Experience the majesty of Everest, the world’s highest peak, on an active 17-day Nepal trekking adventure to Everest Base Camp (17,598 ft) in April 2019. Ease into your challenging journey to Everest Basecamp with visits to several of Kathmandu’s most impressive shrines, including the festive Swyambunath, or “Monkey Temple,” the stately gold-topped dome of the Boudhanath shrine, and the multi-level Pashupathi Nath temple, Hinduism’s most popular pilgrimage site. Get to know your fellow adventurous travelers and marvel at the panoramic views of the Himalayas together on your flight to Lukla, where you’ll meet up with the Sherpa mountain staff (and the shaggy yaks who will be carrying your gear!). Marvel at the milky-white waters of the River Dudhkoshi on your first day of trekking. From there, you’ll pass through picturesque Tibetan villages on foot, traversing mountain passes on narrow suspension bridges as you make your way into the foothills around Everest. An acclimatization day in Namche is a great chance to connect with the women making this journey with you as you prepare your bodies for your trek. A visit to Everest View Hotel (the name says it all) is perfect inspiration to get started! The next day, you’ll ascend through lush forests on your way to the Tengboche Monastery, high in the foothills of Everest. Keep your eyes open for the mani stones lining the path, carved with the Avalokiteshvara mantra of Tibetan Buddhists. At the monastery you’ll get a fascinating glimpse into the lives of Tibetan Buddhist monks, as well as jaw-dropping views of all the highest peaks of the Himalayas. You’ll have time to acclimatize to the altitude before picking your way across the frozen glacial river, Thukla, and up to Everest Base Camp. A visit to the black-rock slopes of the Kala Patthar will offer breathtaking views of Everest’s summit. Make sure to snap some photos with your new friends! Catch one last glimpse of the jagged peaks of the Himalayas on your flight back to Kathmandu, where you’ll have time to explore Thamel, Kathmandu’s vibrant local market. From start to finish, this April 2019 Nepal trekking journey to the foot of nature’s most spectacular creation, Mount Everest, will be unforgettable! In 2017, our guest Brenda put together this fun video about what it’s like to walk through the streets of Kathmandu. Enjoy! Enjoy a welcome dinner this evening with your group in Kathmandu. This morning, you’ll explore Kathmandu as a group. You’ll visit Swyambunath, a Buddhist shrine also called the monkey temple, Boudhanath, and Pashupathi Nath, a Hindu pilgrimage site. Soak in the hustle and bustle of this busy city. Enjoy lunch on your own at one of the many local restaurants. Late this afternoon, meet your trekking guide for a briefing on the trip and a gear check. Wake up early this morning and head to the airport for your flight to Lukla. During this short flight you’ll see panoramic views of the surrounding mountains. When you arrive in Lukla, you’ll meet your Sherpas for the trek, as well as your yaks which will carry your bags. Continue trekking today along the banks of the Dudh Koshi River. Pass by many small mountain villages and cross several suspension bridges. You will trek slowly to help your body adjust to the altitude. Reach Namche this afternoon. Once you arrive in Namche, take some time to kick your feet up at your lodge. Take a short hike today to help your body adapt to the elevation. Walk to Khumjung, passing the Syangboche airport. On the way, you’ll stop at Everest View Hotel for, you guessed it, a spectacular view of Mount Everest, Mount Amadablam, and more (weather permitting of course). On the way back to Namche, visit Sir Edmund Hillary’s school and hospital at Khumjung and Khunde. Complete your walk down to Namche and rest up tonight. Head to Tengboche this morning. You’ll start by hiking downhill to the river, and crossing to the other side. Once you cross the river, the trail climbs steeply up at first, and then becomes a gradual ascent through forests and mani stones. Arrive at the Tengboche Monastery, which boasts the most magnificent view of the Himalayan giants: Kwangde (20,299 feet), Twachee (21.463 feet), Amadablam (22,349 feet), Everest (29,029 feet), and Nuptse (25,850 feet). Leave Tengboche and descend to Debuche through a forest of birches, confiers, and rhododendrons. Cross the Imja Kohla River on a steel bridge, and then the route begins to climb to Pangboche. From Dingboche, you will be treated to views of Island Peak, Makalu, and another face of Amadablam. Head out for a short hike near the Nangakarshang Hill to continue acclimatizing. Enjoy beautiful views of Lhotse, Makalu, and Cho Oyu, and admire Cholatse and Taboche peaks before returning to Dingboche. Leave Dingboche and trek through the high alpine regions. Cross the frozen glacial river at Thukla and climb as you ener Lobuche, admiring the magnificent views of Cholatse, Lobuche, Pumori, and Nuptse. Leave Lobuche and hike very slowly to Gorakshep. Along the way, you’ll see the Khumbu Glacier. Once you arrive in Gorakshep, you’ll see Mount Pumore and Mount Nuptse standing above you. After taking a short break in Gorakshep, hike to Everest Base Camp (17,598 feet). You may get to have lunch in the camp at Everest Base Camp, depending on weather. Take some photos and head back down to Gorakshep for the night. Celebrate your accomplishment with a well-deserved good night’s sleep. Climb Kala Patthar this morning to take some photographs of the panoramic view of Mount Everest and its range. Start hiking down to Pheriche. You will move faster going downhill, and descending to lower elevations will feel great! Keep trekking down from Pheriche to Tengboche today. You’ll be thankful for your trekking poles on these long, downhill days! Today is another long descent day to Monjo. You’ll have a great time celebrating your accomplishment with your fellow AdventureWomen trekkers along the way! Don’t forget to enjoy the views as you hike downhill. Enjoy your final hike in the Himalayas as you descend to Lukla. Celebrate this evening with your Sherpa friends as they share their culture with you. Leave Lukla today and fly back to Kathmandu. You’ll be transferred to your hotel. Enjoy some time to explore Kathmandu today. Have dinner at one of the many delicious local restaurants. Today is free to explore. Check out the markets and do some shopping, wander the streets, or just relax with a coffee and watch the hustle and bustle of daily life in this busy city. Have a farewell dinner with your group this evening. Enjoy some traditional performances as you celebrate the end of a bucket-list adventure with your AdventureWomen group! Arrive: Arrive in Kathmandu, Nepal (KTM) on April 14, 2019 by 2:00pm. Depart: Depart Kathmandu, Nepal (KTM) on April 30, 2019. We rate this trip as Challenging. Our Challenging adventures get your heart rate pumping, these are demanding yet deeply rewarding and designed for seasoned outdoor enthusiasts. You should be in excellent physical condition, and be able to hike up to 10 miles, in steeper, more rugged terrain. Suggested Gratuities: We will advise the number of assistant guides and porters closer to departure. Final payment is due to AdventureWomen in a cash form (check, money order, or wire transfer) on or before January 14, 2019. The lodges you will stay in on this trek are small, simple tea houses. At some lodges, you will have en suite bathrooms and showers, and at others, you will have shared bathrooms and no showers. All of the lodges provide comfortable, clean, and basic accommodations, plentiful food, and boiled water. Temperatures on your trip tend to be quite cool in the morning and evening, and will warm up a bit at midday. You will experience temperatures as low as 10°F and highs of about 60°F during the day. You need to be prepared for all weather on this trek. Dress in layers. You are allowed one 22 pound checked bag and one 11 pound carry-on bag on the flight from Kathmandu to Lukla. You can store extra luggage in Kathmandu while you are trekking. What guests are saying "Nepal: Trekking to Everest Base Camp"
Are you ready to take your adventure vacations to a new level? To push yourself outside of your comfort zone while traveling on your own? AdventureWomen has created some wonderful opportunities for our guests ... Read more.